Accumulating evidence suggests that sigma-1 receptors play a role in the pathophysiology of neuropsychiatric diseases, as well as in the mechanisms of some selective serotonin reuptake inhibitors (SSRIs). Among the SSRIs, the order of affinity for sigma-1 receptors is as follows: fluvoxamine > sertraline > fluoxetine > escitalopram > citalopram >> paroxetine. Some SSRIs (e.g., fluvoxamine, fluoxetine and escitalopram) and other drugs (donepezil, ifenprodil, dehydroepiandeterone (DHEA)) potentiate nerve-growth factor (NGF)-induced neurite outgrowth in PC12 cells, and these effects could be antagonized by the selective sigma-1 receptor antagonist NE-100. Furthermore, fluvoxamine, donepezil, and DHEA, but not paroxetine or sertraline, improved phencyclidine-induced cognitive deficits in mice, and these effects could be antagonized by NE-100. Several clinical studies showed that sigma-1 receptor agonists such as fluvoxamine and ifenprodil could have beneficial effects in patients with neuropsychiatric disorders. 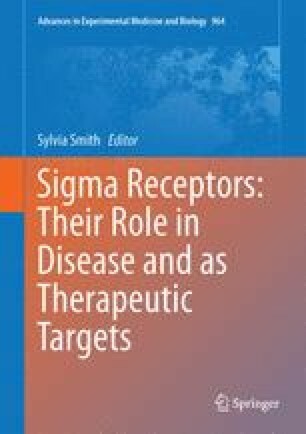 In this chapter, the authors will discuss the role of sigma-1 receptors in the mechanistic action of some SSRIs, donepezil, neurosteroids, and ifenprodil, and the clinical implications for sigma-1 receptor agonists.